FLYHT announced its participation in the Boeing ecoDemonstrator Program on August 10, 2017 in this press release. This letter is intended to provide more information about FLYHT’s participation in this trial and what we intend to demonstrate. FLYHT is one of the collaborators on the program and is excited to be able to work with a very distinguished list of companies. FLYHT has delivered our Automated Flight Information and Reporting System (AFIRSTM) 228S system and kit to Boeing for installation on the FedEx B777 this month. The aircraft was delivered back to Boeing from FedEx in mid-January for this installation. Among other activities, the aircraft livery will be updated with decals outlining the program and the partners involved in the program. An image of the aircraft without the partner decals is shown below. The program will evaluate over 30 technologies including evaluations in advanced manufacturing and materials, digital aviation, along with cabin, electrical, technology, flight control and flight science enhancements; new propulsion and fuel technologies and enhancements to test technologies and factory processes. Also, being tested are new flight deck changes and avionics. FLYHT’s technology falls into this last category where we will demonstrate state of the art aircraft tracking, locating and data recovery technologies using our AFIRS and UpTimeTM Cloud technologies. We are excited to be the only company chosen to demonstrate these technology capabilities for the program. Regulatory changes that were causing Boeing and other airframers and operators to look at FLYHT’s technology were discussed in a two part letter last year which is published on FLYHT’s website and is copied here (Part 1, Part 2). The context diagram for FLYHT’s portion of the program is shown in the diagram below. 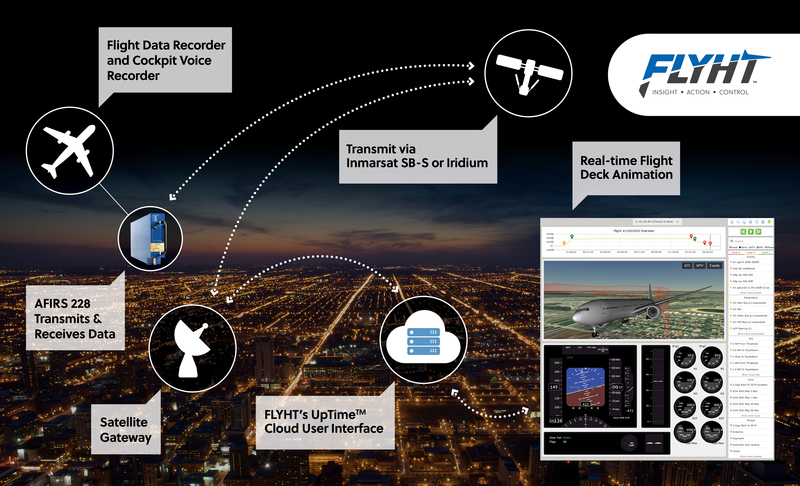 The FLYHT AFIRS product is connected to the same data sources that the aircraft’s flight data recorders (FDR) and cockpit voice recorders (CVR) receive their data from. The AFIRS 228S product transmits essential parameters from the FDR over the Iridium low earth orbit constellation to UpTime Cloud via the Iridium satellite gateway. Our customers, in this case Boeing, will securely log into UpTime Cloud over the internet to bring up the UpTime user interface which now includes a real-time animation of the aircraft and flight deck instruments which are driven by the real-time data delivered from AFIRS. A close-up of the situational awareness display is shown below which we have developed in partnership with Flight Data Services, a strategic partner. At the top is a flight profile which shows elevation versus time and key flight phase elements. The aircraft flight path is simulated below that with real-time location updates delivered from AFIRS over the satellite network. Below the aircraft attitude simulation are various aircraft instruments that simulate active flight deck based on the flight data that is being delivered in real time to UpTime Cloud. Operators will appreciate the situational awareness enhancement that this type of ground-based interface depicting an active flight can present, particularly when there is a problem encountered during the flight. FLYHT has been busy adding this feature to our product along with other capabilities to make the demonstration an excellent indicator of the value proposition of FLYHT’s intellectual property. Another enhancement we have created is the ability to also stream larger amounts of data over an Inmarsat SwiftBroadband Safety (SB-S) network. Inmarsat SB-S network is a geosynchronous satellite network that offers significantly larger bandwidth than the current Iridium network. (FLYHT has announced a trial with Inmarsat in addition to Boeing using the SB-S network which will be discussed in a different CEO letter). FLYHT can send significantly more data over this network, including cockpit audio. FLYHT has acquired a digital cockpit area microphone from another strategic partner, L-3 Technologies, which delivers digital cockpit audio samples from the cockpit via an aviation standard digital bus. The result is that FLYHT can stream the cockpit audio as part of the situational awareness display, further enhancing the real-time informational aspects of the system and creating a virtual flight deck in the Aircraft Operations Center! FLYHT is very excited to demonstrate the future of situational awareness and timely access to flight data through this program. Upcoming key dates include the installation in mid-February, customer training on FLYHT systems in late February, and the flight test beginning in early March to be completed in late April. Following the completion of flight testing, FLYHT will be working with Boeing to present the data that is collected through this portion of the trial to two different industry working groups to create proposals to standardize systems for autonomous distress tracking and timely access to flight data. FLYHT is very proud to be working with Boeing and FedEx on this program and we are optimistic that our intellectual property and capabilities in this area will lead to outstanding growth opportunities as we exploit our unique position in the industry.